Nevada passed a constitutional amendment in the year 2000 legalizing marijuana use for medicinal purposes. The details of how Nevada’s medical marijuana legislation has been promulgated is covered in another blog; this blog will cover the November 8, 2016 ballot initiative that proposes to legalize recreational marijuana. Our office frequently gets questions asking how the proposed Initiative to Regulate and Tax Marijuana (“Initiative”) will modify the current medical marijuana law. In short, the proposed Initiative will leave Nevada’s medical marijuana program intact while providing a separate avenue for the recreational use of marijuana for adults 21 years of age and older. The Initiative is currently contained as Question 2 on the November 8, 2016 ballot. The use of marijuana will no longer be illegal for personal use. Individuals may possess up to 1 ounce of marijuana or 1/8 of an ounce of concentrated marijuana. You must be at least 21 years old to purchase, possess, or consume recreational marijuana. Adults may purchase marijuana from retail marijuana stores which have been properly licensed by the State of Nevada. Adults who do not live within 25 miles the retail marijuana store may grow up to six marijuana plants in a properly secured and not publicly visible area. The Nevada Department of Taxation will oversee a network of licensed marijuana retail businesses, testing facilities, cultivation facilities, product manufacturers, and distributors. The Nevada Department of Taxation will be responsible for adopting and enforcing rules regarding the packaging, labeling, tracking, and testing of marijuana products. The Nevada Department of Taxation will create the marijuana business licensing procedures, signage and advertising procedures, and marijuana establishment security requirements. Marijuana business owners will be subject to State review to confirm the business is suitable to produce or sell marijuana. A marijuana establishment may hold a “dual license” to sell both recreational and medical marijuana at the same marijuana establishment/location. All marijuana sold in the state of Nevada must tested and labeled. Contracts relating to marijuana are now enforceable under the public policy of Nevada. Marijuana establishments must be safe, secure, and controlled access points that will protect both the establishment and the customers. Marijuana at wholesale will be subject to a 15% excise tax that the licensed cultivators will be responsible for paying. Retail marijuana will be subject to the existing state and local sales taxes and adjusted in the manner those taxes are normally adjusted. Marijuana taxes are first earmarked to fund state and local implementation and enforcement of marijuana regulations. Marijuana taxes left over after paying for enforcement and regulation will be deposited in the State Distributed School Account which is used to support public schools in grades K-12. Marijuana use will still be prohibited in public. This means marijuana cannot be used on a public street, inside retail marijuana establishments, parks, or any other public place. Possession or use of marijuana on the property of any school, from preschool to High School, is prohibited. Existing laws regarding driving under the influence of marijuana (sometimes called Drugged Driving) will remain in force and effect. This means that driving under the influence of marijuana will remain wholly illegal just as it is now. All aspects of marijuana from cultivation to sale must be conducted by state licensed individuals or businesses. Unlicensed individuals or businesses may not sell marijuana. Unlicensed individuals or businesses may not create marijuana extracts using butane or any other potentially hazardous product. A marijuana cultivation facility may not sell to consumers directly. A marijuana distributor may not sell to consumers directly. Only a retail marijuana store may sell directly to consumers. The proposed initiative will have no effect on the ability of employers to regulate marijuana in their workplace or implements marijuana policies and/or restrictions on marijuana consumption by employees. Employers’ current marijuana policies will not be affected. The proposed initiative will not affect current existing medical marijuana laws. The proposed initiative will not affect or abridge any medical marijuana patients’ rights currently in effect. Speak to a marijuana attorney today to ascertain how they can help in obtaining the best outcome possible with any of your marijuana issues – from licensing to criminal defense. 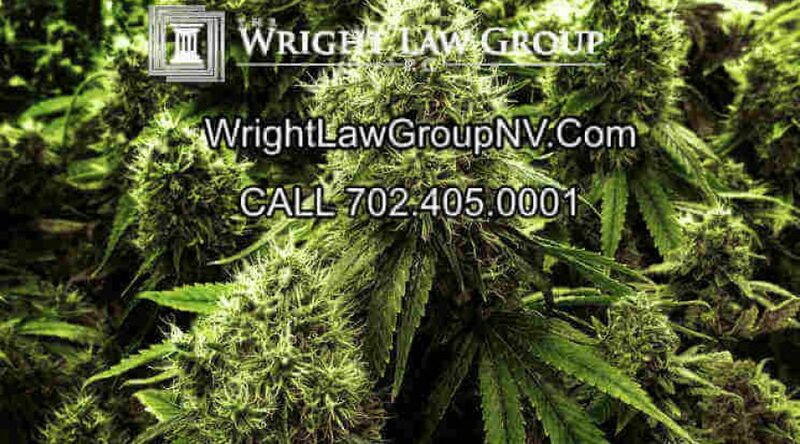 But don’t let just any law firm handle your case – THE WRIGHT LAW GROUP, P.C., is a highly experienced and respected law firm specifically dedicated to representing persons with marijuana objectives or defending those criminally charged with marijuana offenses in Las Vegas and throughout Clark County, such as possession, trafficking, manufacture and sale of all cannabis derived substances. Presently in his 25th year of practice, founder John Henry Wright, Esq., is peer rated A/V by Martindale & Hubble as “Preeminent” in the fields of Criminal Law and Litigation, but it is also our unique perspective and experience that sets us apart. THE WRIGHT LAW GROUP, PC is up to date to on all the current laws, statutes and regulations involving medical and recreational marijuana in Nevada. We have extensive experience in both Criminal and Civil litigation.